Tonight, Baskin Robbin’s Ice Cream is having their annual 31 cent scoop evening. Yes, today, Wednesday, April 27, 2011 from 5pm to 10pm you can get a scoop of Baskin-Robbins ice cream for only 31 cents! Check to make sure your location is participating. There have been some amazing sales on Wisk lately. Pair the sales with this $2 off Wisk coupon and you have great stock pile prices. This is at Walmart for around $1.70. Use this $1.10 printable coupon, which makes this only $0.70. For a special treat, there are multiple candy coupons available. These yummy gummies are often on sale less than $1, if your store doubles, that’s a great find. 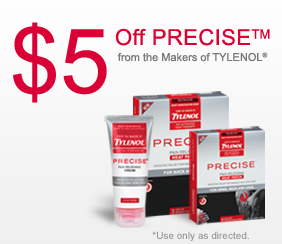 Tylenol just came out with a new $5/1 Precise Product printable coupon. Print it now and hold onto it until the Walgreen’s May Coupon Booklet comes out. They are normally $7.95, but you can stack these two coupons for some FREE Tylenol Precise.